A novel series of A-ring modified hexacyclic camptothecin derivatives containing a pyranone ring fused at the 9-positions and 10-positions were designed and synthesized. 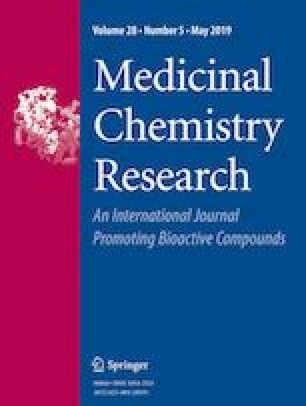 These new derivatives were screened against four human tumor cell lines and the results showed most of the compounds possessed comparable cytotoxicity to 10-hydroxycamptothecin (HCPT) in vitro. The pyranono-fused derivatives, except for the one with methoxyformyl group at 4′-position (12), displayed similar inhibitory efficiency to saturated dihydropyrano-fused camptothecins (6 and 7) and superior cytotoxic activity compared with topotecan (TPT). These results indicated that the saturated and unsaturated fused-pyran rings would not disrupt the base-stacking between camptothecins and the DNA base pair, as well as the interactions between the compounds and Topoisomerase I. The online version of this article ( https://doi.org/10.1007/s00044-019-02342-4) contains supplementary material, which is available to authorized users. This work was supported by Shanghai Committee of Science and Technology of China (No.14431900600) and the Scientific Research Foundation of the Third Institute of Oceanography, SOA (No. 2018013).